On a country farm in rural Louisiana a masked figure, clad in bright costume and a tall pointed capuchon, approaches a little girl who retreats nervously into the safety of her mother’s legs. He crouches submissively, uttering a high pitched “whoop, whoop” and pointing repeatedly to his outstretched palm. The girl squeals in excitement mixed with fear as he thrusts a grotesquely masked face close to her but she stands her ground and offers a small coin supplied by her mother. The Mardi Gras takes the coin and places a string of bright beads – purple, green and gold being the preferred colours – around the girls neck. He moves on to the next victim. Elsewhere on the farm many similar scenes are being enacted with beer fuelled revellers climbing telegraph poles, rolling in mud and chasing chickens, it’s all very high spirited and good natured. The farmer has a huge spread of food for the party and anyone who comes to watch, its typical Cajun hospitality. 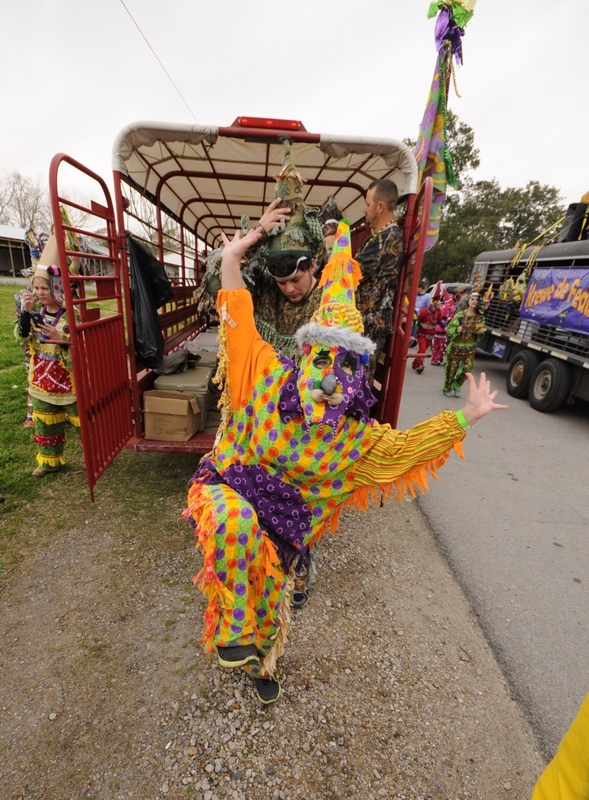 This is the Sunday before the day known as Mardi Gras or Fat Tuesday in French Louisiana and the Mardi Gras revellers are out all over Cajun country. To the the towns and villages people come from all over the world to visit and party before the fasting time of Lent in this Catholic part of the state. Theres a tap on my shoulder and the farmer is there , he grabs my hand with a grip that feels like it was built by John Deere. “Good to see you back, go get yourself some food.” The last time I was here was two years ago but Cajuns don’t forget you. And when they say “Come back and see us” they really mean it. So put Louisiana into your holiday diary and let the good times roll cher.